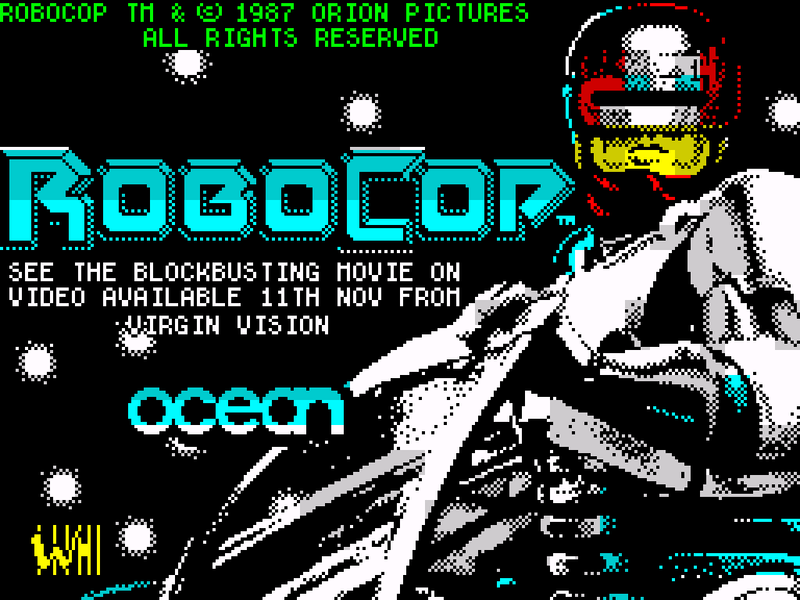 Do you remember… the music from RoboCop on the Speccy? In my sporadic “Do you remember…” series, I whack on some rose-tinted specs and wax lyrical about specific aspects of the classic and not-so-classic games of yesteryear. I’ve only more recently gotten into emulating the ZX Spectrum, so it’s almost 30 years since I last played the majority of its games. And I must admit, my memory is a little hazy (I was very young at the time!). Some games are relatively clear in my mind, others vague and dreamlike recollections that I struggle even to recall the name of. But one game from that era which prominently stands out in my mind is RoboCop. How I loved the music from this game! 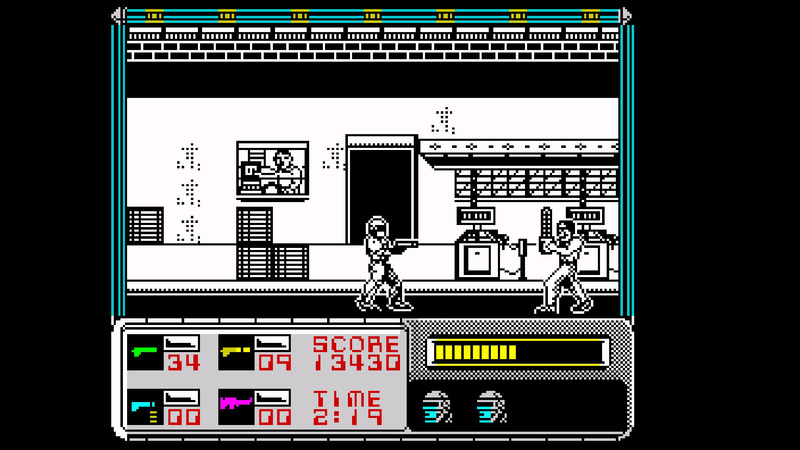 Developed and published by Ocean Software in 1988, RoboCop was both a movie tie-in and an arcade conversion. Ocean’s raison d’être seemed to be lazy, uninspired licenced games, and boy did they churn them out (actually, the same can also be said for U.S. Gold). RoboCop was definitely one of their better efforts. The main game combines relatively simple arcade shooting and platform elements, featuring your typical weapon, ammo and health pickups as well as a level-based time limit. Bad guys come from both directions, pop out of windows and appear on platforms above you. They attack with fists, drop kicks, guns, and chainsaws. There’s the occasional boss fight with ED-209, who seems to keep coming back for more. The locations and between-level mini-games (hostage shoot-outs, photo id challenges) loosely correlate to scenes from Paul Verhoeven’s 1987 film. It’s fun and reasonably challenging, though far from impossible. You need to conserve your ammo, prioritise your targets and learn when and where the baddies attack. There’s a lot of ducking. Even back in the day, RoboCop was hardly very original, but I adored it nonetheless. The monochrome pixel art is beautifully drawn and animated. The Speccy’s notoriously ugly attribute clash is nowhere to be seen. Despite the machine’s serious graphical limitations, it does a brilliant job of nailing RoboCop’s stiff walk, posture and gun pose. The sparse backgrounds still somehow pack in a lot of detail, conveying the essence of a grimy, seedy and dangerous downtown Detroit. Plus, it features a gorgeously-rendered loading screen of the eponymous cyborg stepping out of his police cruiser. However, the real reason RoboCop stays with me is the music. If you’ve only played it on a 48K Spectrum, you won’t know what I’m talking about – that version barely featured sound at all. But thanks to the AY-3-8910 chip (the Speccy and Amstrad equivalent of the legendary SID chip), us pompous 128K owners were treated to some ropey digitised speech (“Robocop!! !”) and a sumptuous soundtrack. Even after all these years, Jonathan Dunn’s sombre yet wonderfully melodic title theme still sends shivers down my spine. The first time I booted it up it blew me away. Subsequently, I would load it just to listen to the music pour from the crappy single speaker of my crappy 14-inch TV. I found myself, still am, mesmerised by its repetitive, robotic rhythm. For the first 50 seconds or so, a series of intervals slowly fade in and out across a simple melody. Then another rhythm kicks in with a semi-improvised part layered on top. It’s soulful and jazzy. Towards the end it breaks down again, the original intervals return, now backed by an endless trill. It loops back into the intro after three minutes and 12 seconds of pure bliss. The in-level music is also something to cherish. Once again, Dunn layers simple, alternating rhythms and melodies on top of one another, using breaks to great effect and making the most of the three channels. As with the short tune that plays during the mini-games, it’s more up-tempo, more upbeat, more urgent than the main theme. It impels you forward, it excites, it complements the action. Dunn’s soundtrack is affecting and evocative. It somehow captures the spirit of both the music from the arcade machine and Basil Poledouris’ film score, yet retains its own unique identity. More importantly, it elevates an above average platform shooter to something special and unforgettable in my mind. Jonathan Dunn also created the music for the Commodore 64 and Amstrad CPC editions. However, there’s too much going on in the C64 version – it sounds messy at times, too busy; the instrument choices jar. Whereas the Speccy and Amstrad CPC soundtracks, which are virtually indistinguishable, are much cleaner and simpler and all the better for it. Of course, the other versions of the game also feature colour graphics. But they’re too colourful, too saturated – they’re positively gaudy. This is supposed to be a dystopia after all, not Rainbow Islands or Super Mario Bros. And let’s not talk about the awful Amiga version, which adheres much more closely to Data East’s cynical, coin-devouringly-hard arcade machine. And that’s why, for me, the ZX Spectrum’s RoboCop is the definitive version. God, how I love that music! By the way, if you’re a fan of the music from the original arcade game, you should check out Protector 101’s fantastic take on it. December 5, 2017 in Retrospectives. ← Do you remember… the Amiga version of UFO: Enemy Unknown?